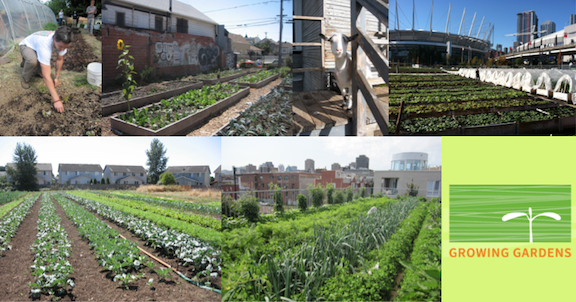 In this Capstone, we will critically examine the limits and possibilities of urban agriculture’s contribution to the food system. The course balances seminar-style reading and discussion with a hands-on project. Our community partner is Growing Gardens, an organization establishing urban gardens for low-income residents throughout Portland. Through this year's final Capstone project (see below), we will collect stories from Growing Gardens project participants, and will produce short podcast-style audio/visual pieces to contribute to the PDX Garden Stories website and to help Growing Gardens in their outreach efforts. The course will meet twice a week (MW, 2 to 3:50 in 311 URBN). During the first half of class, students will discuss readings seminar-style and hear from guest speakers involved in Portland’s urban agriculture movement. We will devote the second half to work on the Capstone project. On Saturday, April 9th, we will also participate in a Growing Gardens garden build, where we will discuss the basics of sustainable food production while getting our hands dirty. Students will also need to complete 10 additional volunteer hours at a garden outside of class. We'll complete a project that addresses the needs expressed by our community partner, Growing Gardens. The project is intended to serve both students—by providing them with an opportunity to engage with Growing Gardens’ efforts and to develop research and audio-visual communications skills—and Growing Gardens—by providing it with qualitative data in the form of oral histories gathered from participants in their Home Gardens, Growing Huertos, and Lettuce Grow programs. These stories -- essentially short podcasts accompanied by images, will provide Growing Gardens with valuable information about the work they are doing and will help the organization move forward in its mission “to improve nutrition, health and self-reliance while enhancing the quality of life and the environment for individuals and communities in Portland”. The project will be of special interest to students interested in food systems and community development, but also to those interested in podcasts, radio, interviewing, editing, storytelling, and qualitative research.